Our recent customer survey has generated some great feedback and provides real guidance to us to maintain our position as the most fully featured and innovative Outdoors GPS Navigation mobile app. It was great to see that over 90% of respondents rated our app as 5 or 4 stars. Amongst the features identified as required for the future, there were some capabilities that are already available within the current versions of ViewRanger, so we thought it would be good to tell you more about how to get to use these. Getting the right Coordinate…A number of people asked if it was possible to see the map coordinate of their current GPS location. This is already available to view via the “top bar” of the screen (see screen grab). By default on Apple & Symbian, or by tapping the top bar and selecting the display option on Android, you can move the map and view the coordinates of the map centre cross hairs for any location. We also support many different map coordinate systems as used in different parts of the world, including the one asked for several times Lat/Lon in degrees, minutes, seconds. 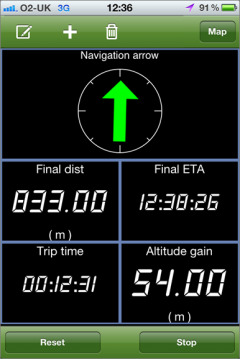 You can select your preferred coordinate type within the settings (map - apple, display - android, UI - Symbian). Marking a Location on the map…..Another area related to creating marked locations on the map and navigating to that place. This capability is supported using our POI (point of interest) feature. By creating a POI you can mark a location, for example where you’ve parked the car, or at a map coordinate using the manual location feature. Apple use the "bulleted list" button and select 'create POI”, on Android use menu, then Create and for Symbian use Options, then Create. You can customise the icon on the map. Having created a POI, you can navigate to that location by tapping on the POI and using the "bulleted list" button, and select “navigate to” and by switching to TripView mode you can see distance to the location, ETA, a navigation arrow and many other stats. Symbian supports "navigate to" by highlighting the POI then pressing the central circle icon. 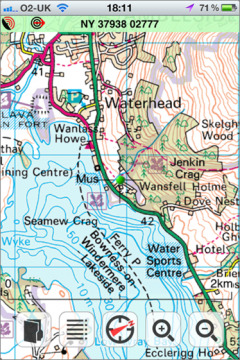 Decluttering your map view….. As you record more tracks or download more routes the map view can get rather busy. It’s easy to hide tracks or routes such that they are still saved in the app but hidden (all or individually), until you next need them. To do this, you’ll need to go into the organiser (filofax icon) and select tracks or routes and use the > and scroll down to hide. Android and Symbian have a toggle button to hide/show tracks and routes. What is My.ViewRanger.com….This is your web control centre for route planning and for sharing your adventures, its free and you can log in using your ViewRanger sign-in details and search, create, publish and share with your friends and the ViewRanger community. My.ViewRanger lets you use the big screen of your pc or mac to search our routes database or create your own by hand or automatically. Then synchronise all your routes and tracks seamlessly with one touch - no wires needed.